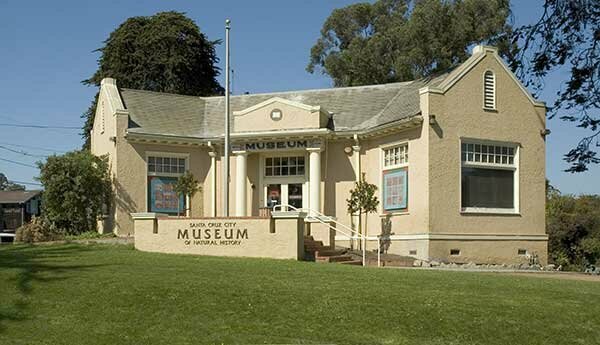 The city of Santa Cruz received a total of $29,000 in Carnegie funds, $20,000 for the main library in 1902 and $3000 for each of three branches in 1913. All were designed by W.H. Weeks. The 1904 Romanesque Santa Cruz Main, his first design, was the scene of a 1910 visit by Andrew Carnegie, a festive civic event. It was demolished in 1966. The old East Cliff and Seabright Carnegie library building is located in a park on East Cliff Drive between Pilkington Avenue and Brook Avenue, a residential neighborhood. The small, Classical Carnegie under a steep gable roof has been extended with additions behind and below on its steeply sloping site. The East Cliff and Seabright communities shared a library history dating from 1896, its locations including a boat house, a tent city, and a community built 16'x24' building. The Carnegie building opened in November 1915. In the early 1950's the Hecox natural history collection was incorporated into the library and in 1965 the library withdrew. The extensions, made in 1962 and 1968, were to accommodate the growing museum and further expansion is being considered.